Three unrelated developments came together in 1931 to launch an annual celebration of high school student talents in Cleveland for more than three decades. The annual showcase of football, marching bands, and artists occurred each Thanksgiving weekend. The rich tradition of scholastic football in the Cleveland area dates back to the beginnings of American football in the United States. At the collegiate level, the game first emerged among East Coast schools as a variation of the English Rugby Code in the mid 1800s. Nearly three decades of organized contests saw leaders of the sport revise rules and tactics to improve the game for its participants. In 1890, the Cleveland Plain Dealer printed an article explaining the game and introducing its readers to the state of the game in the area. Case Institute of Applied Science and Adelbert College (Western Reserve University) had been playing "the Rugby Game." 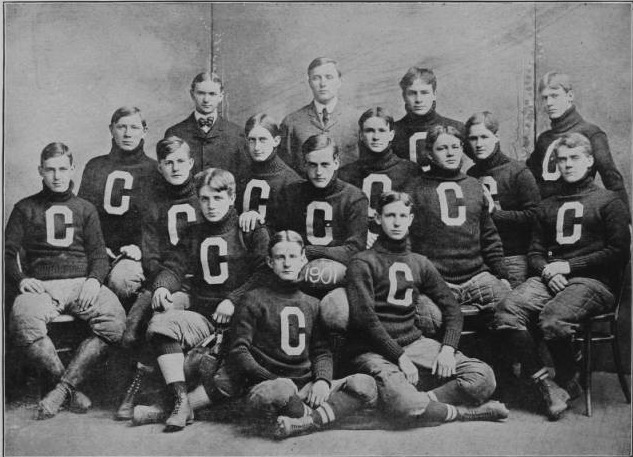 In 1890, the Cleveland School Athletic Association was formed to include both college freshman teams with a team from Cleveland Central High School on East 55th Street (its first public high school) and a new private school called the University School located on Giddings Avenue between Lexington and Hough Avenues. And so, a four-team league initiated the region's high school football scene in the fall of 1890. The next 40 years were marked by many challenges, the near extinction of the game, reform and massive growth and popularity building westward across the county. Meanwhile, the Cleveland scholastic scene mirrored the trends. As the city population grew with its schools, more teams took to the fields and the school leaders organized a senate athletic league to govern the game and its contests. Each year the league would determine a city champion based upon regular season records of competing league schools. The field of local teams expanded to include teams from beyond the city and school district boundaries during the 1900s through the late 1920s. Shaw, Lakewood, Cleveland Heights, and private schools Saint Ignatius, Cathedral Latin, and others were considered for the competition for a city championship. Furthermore, fan interest was large enough to promote local, regional, and state level contests to determine scholastic football superiority. Economic collapse interrupted a large part of America's lifestyle in 1929 when income and resources declined dramatically. 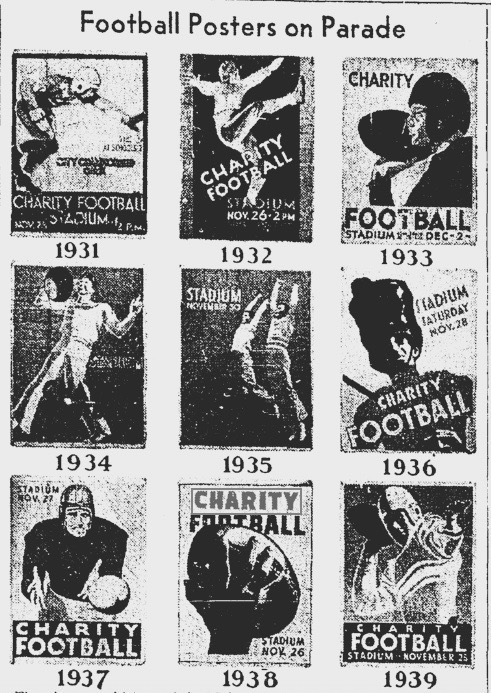 In 1930 government leaders at all levels sought ways to raise funds for relief of the unemployed by organizing postseason collegiate football contests. An aide to President Herbert Hoover suggested a charity football game in every city, with proceeds supporting local relief efforts. Cleveland "took the ball and ran" with a plan to organize a city championship game for charity. Coincidentally, the city was completing construction of a new lakefront stadium in July 1931 with a seating capacity over 78,000 spectators. Cleveland’s stadium commissioner approved the site for the Charity Game for rent of one dollar, ushering in the beginning of an era. 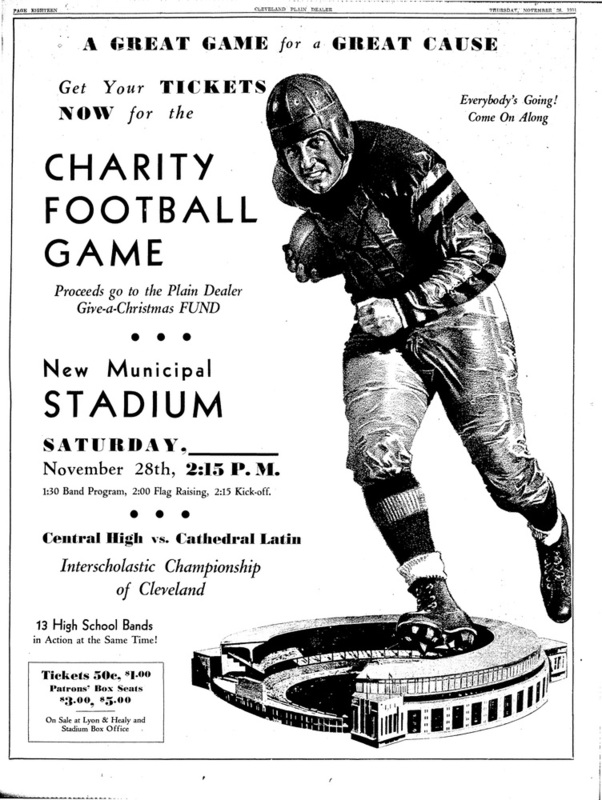 Game opponents were selected after the regular high school season ended in November 1931: Cleveland Senate leader Central High would face Catholic League leader Cathedral Latin in front of 19,304 fans on ‘Thanksgiving Saturday.’ The game raised $8,200 for Plain Dealer Charities’ Give-a-Christmas food basket program. Latin prevailed 18-0 to become the city’s first Charity Game Champion. 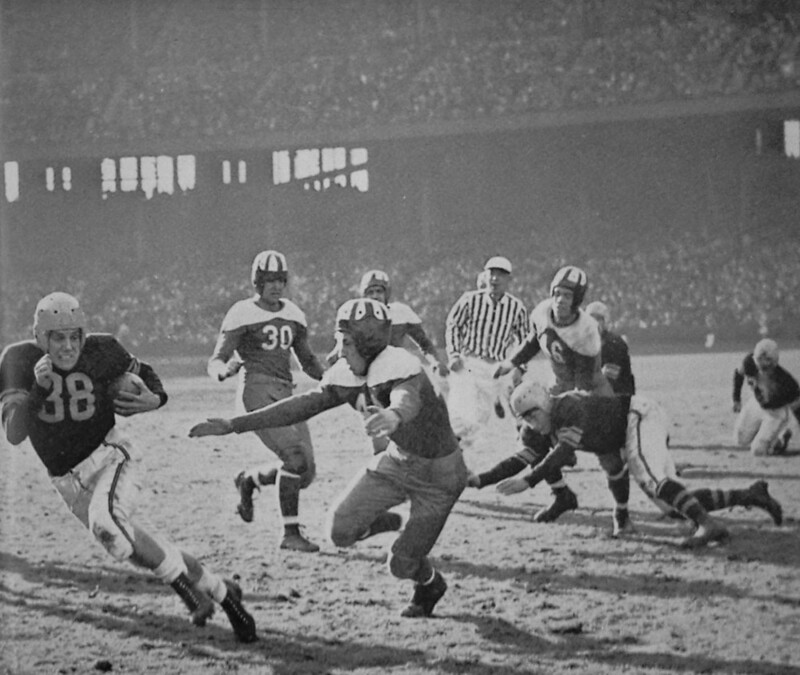 Thus began a very popular run of high school football games to determine Cleveland’s champion annually on Thanksgiving weekend for the next 37 years at Cleveland Municipal Stadium. Some team and league alignments were modified as Cleveland and its surroundings continued to grow. In 1936, the Cleveland Senate Athletic League was reorganized to include schools within the city limits with four Catholic high schools and 13 Cleveland public high schools in the East and West Senate divisions. The annual champs of both Senate divisions would face each other in the Thanksgiving weekend Charity game. The annual event was marked with a student poster contest, marching band competition from many area schools, and majorette and drum major competitions. The annual game grew in popularity and by 1937 drew 47,000 spectators with larger crowds arriving in the 1940s. In 1946 Cathedral Latin played Holy Name in front of 70,955 fans as envious professional teams took note. 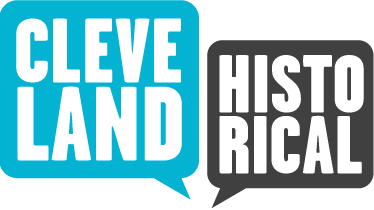 By 1953, proceeds to Plain Dealer charities exceeded $400,000 and continued to support the Give-a-Christmas fund and the Senate’s athletic insurance fund. 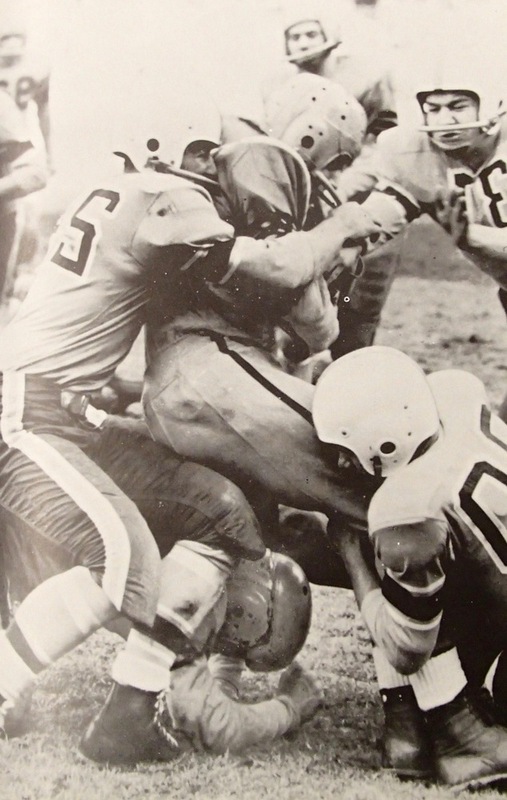 From 1955 to 1968, the game was played on Thanksgiving Day with all the annual traditions and ceremony. Game attendance remained strong, between 20,000 and 40,000 spectators through the mid 1960s. Meanwhile, on the football field, Cleveland’s high school teams battled annually to be crowned city champs. 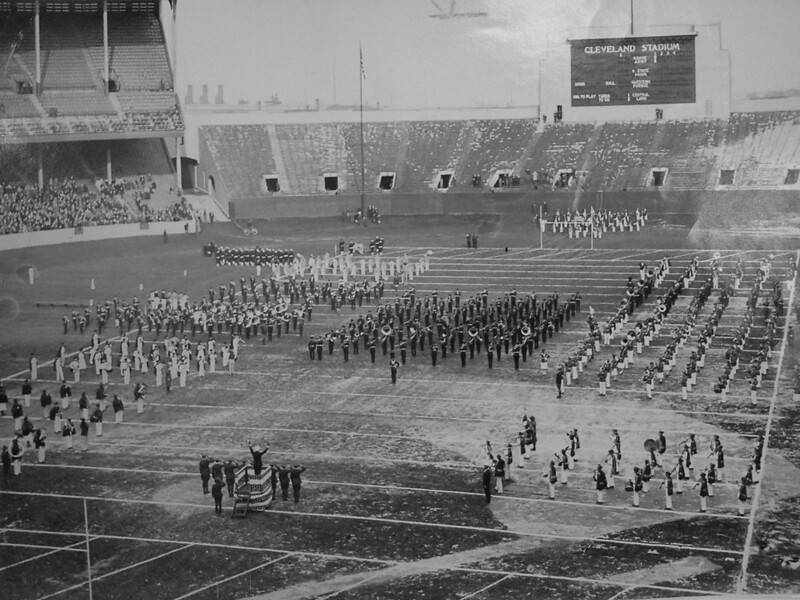 Benedictine (14), Cathedral Latin (13), and St. Ignatius (13) posted the most appearances; Rhodes, Lincoln, Holy Name, Collinwood, and South High also made multiple appearances at the Stadium with numerous area bands and talent squads. The demise of the game at the Stadium began in the 1960s with game day disturbances in the downtown area in 1962 and 1963. 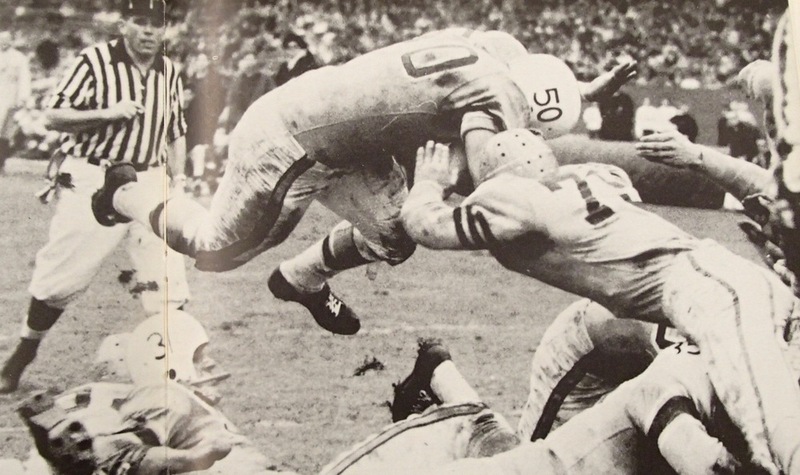 The 1968 contest posted one of the lowest attendances in history of the game and was marred by disruptions at the game and afterwards in the downtown area. Fights at the stadium left one injured policeman among others; vandals smashed windows in downtown storefronts and several fights, assaults, and robberies were reported, causing one councilman to threaten to cancel future games. These troubles combined with the changing trends in high school football—more competitive leagues outside the cities and restructuring of a statewide system of ranking teams for a larger post season tournament—to diminish the appeal of a city championship game of the Charity Game magnitude in the future decades. The game was relocated to local high school fields and the Plain Dealer withdrew its sponsorship. Though a Senate League championship continues to be played, the final game for charity was held in 1987 at John Marshall Field. Cleveland Municipal Stadium hosted the annual Charity Game to raise funds for Plain Dealer Charities from 1931 to 1968. 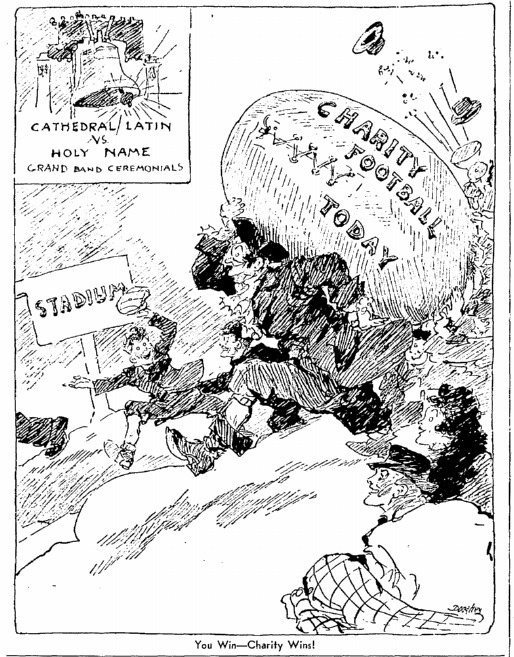 Jim Lanese, “The Charity Game,” Cleveland Historical, accessed April 23, 2019, https://clevelandhistorical.org/items/show/783. Hudak, Timothy L. The Charity Game: The Story of Cleveland's Thanksgiving Day High School Football Classic. Cleveland: Sports Heritage Specialty Publishing, 2002. Published on Feb 7, 2017. Last updated on Jul 26, 2017.